Yesterday was yet another dry day across the state. A handful of isolated storms initiated over the far south-central portions of the state, but these produced minimal precipitation and quickly raced over the border into New Mexico. With no appreciable snow in the high country either, fire remains top of the list of concerns. Since the end of our mid-September heat wave, conditions have been more favorable for firefighters to make ground on some of the large fires in the state. However, several large fires continue to slowly grow and will likely need to be snuffed out by substantial rain or snow. 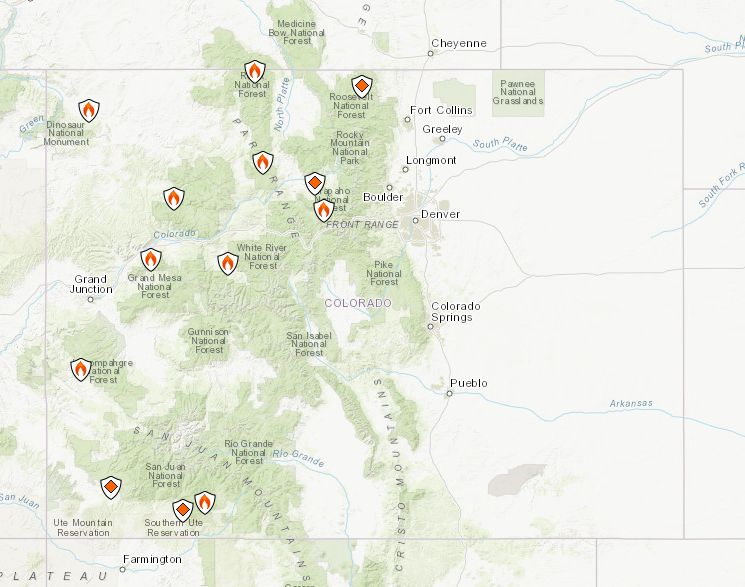 The map below from InciWeb shows current active wildfires with a flame icon and prescribed burns with an orange diamond. More dry weather is in the forecast, but for the time being fire conditions are expected to stay sub-critical. With the potential for substantial rain across the western half of the state next week, the end of the fire season may soon be in sight. Flooding was not reported on Wednesday. For rainfall estimates in your area, check out our State Precipitation Map below. The map below shows radar-estimated, rainfall gage-adjusted Quantitative Precipitation Estimates (QPE) across Colorado. The map is updated daily during the operational season (May 1 – Sep 30) by 11AM. The following six layers are currently available: 24-hour, 48-hour and 72-hour total precipitation, as well as maximum 1-hour, 2-hour and 6-hour precipitation over the past 24 hour period (to estimate where flash flooding may have occurred). The 24-hour, 48-hour, and 72-hour total precipitation contain bias corrections that are not disaggregated into the hourly estimates, so there will likely be some differences. The accumulation ending time is 7AM of the date shown in the bottom right corner. Also shown optionally are fire burn areas (post 2012), which are updated throughout the season to include new burn areas. The home button in the top left corner resets the map to the original zoom. With dry weather continuing to dominate across Colorado, our attention begins to turn towards the fast-approaching end to the growing season. Many mountain valley locations have had several freezes already, and some of the high mountain peaks have seen dustings of snow over the last week or two. However, in the lower elevations, many are still awaiting their first freeze. The maps below show the median date of the first 32°F or lower temperature of fall at a number of stations across the north-central U.S., compared to the dates those stations hit that threshold this year (many have yet to do so). In Colorado so far, we can see that while many mountain locations have seen their first freeze already, most of us on the plains and western slope are still awaiting the end of the growing season (right panel of figure below). 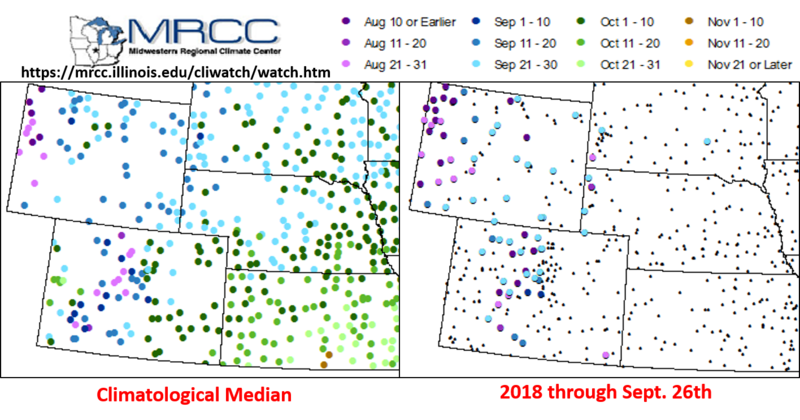 For the Front Range and eastern plains, this typically happens anytime from now (late September) through mid-October; on the western slope, the dates are more variable, but generally run from mid-September to late October (left panel of figure below). The lack of frost hasn’t stopped the onset of fall foliage changes, however. Aspens across the mountains have been changing color since late August in spots and are now expected to approach peak color in the next two weeks. Meanwhile, in the lower elevations, we’re beginning to see patchy color appear, especially in the foothills and along creek and river valleys (where the coolest air tends to pool at night). 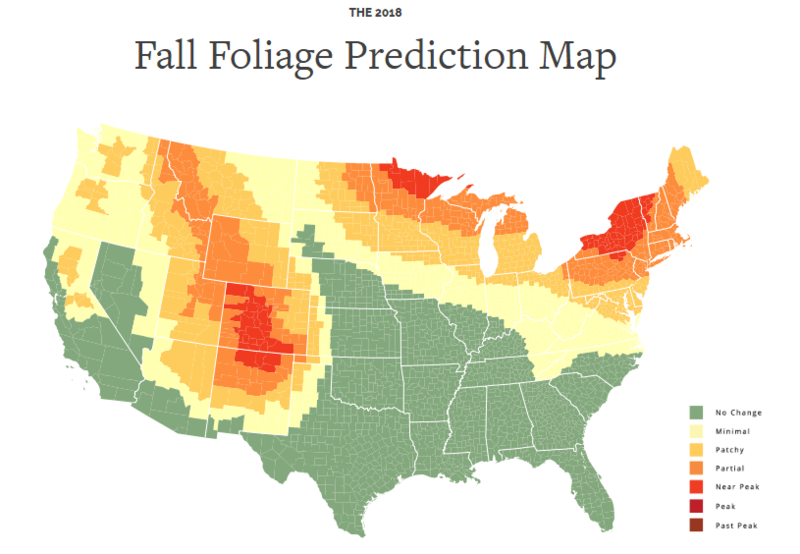 A cool interactive map that shows the predicted evolution of fall color for each week of the fall can be found at https://smokymountains.com/fall-foliage-map/, and shown below is the prediction for October 1st (next Monday). If you’re a fan of the cold and snow, then the time is almost here. Hopefully we can begin getting some high-elevation snow soon to bring a close to fire season and allow the resorts to prepare for ski season. Flooding was not reported on Tuesday. For rainfall estimates in your area, check out our State Precipitation Map below. An upper-level trough passed through the state starting yesterday morning. This meant some showers over the higher terrains to start the morning with snow above 11,000 feet. Over the eastern plains, a cold front moved through, which brought some low-level moisture to the area for afternoon storms. Not as much action over the Southeast Mountains as downsloping winds and drier low-levels prevented storm development. Over the western mountains, there was a CoCoRaHS report in northern Gunnison County that recorded 0.12 inches near Crested Butte. Radar rainfall estimates were up to 0.2 inches over the area. While not a lot of rainfall, any amount of rain helps with the ongoing drought. Gusty winds were recorded as well with afternoon gusts between 45 and 55 mph over the Northern and Central Mountains. To the east, more widespread showers and thunderstorms formed over the Front Range and Palmer Ridge. Drier air in the upper-levels mixed out most of the moisture brought in behind the front, but some high-based storms were still able to form. Totals over the Front Range were below 0.25 inches, but as storms made their way out east there was a little better moisture to increase rain rate efficiencies. A CoCoRaHS station near Otis recorded 1 inch though radar estimates were not quite this high. Flooding was not reported on Monday. To see how much rain fell over your area yesterday, scroll down to the State Precipitation Map below. Not much action yesterday as WSW flow aloft continued to entrain the dry air mass over Utah into the state. There was still enough moisture for some high clouds over the mountains in the afternoon, which helped provide some shade from the warm temperatures. For the first day of fall, it sure felt more like summer. By the late afternoon, the trough to our west began its migration eastward. The upper-level jet associated with the trough mixed some strong surface winds over northwest Colorado, so a Red Flag Warning was issued. None of this was helpful for containment of the Ryan and Silver Creek fires. A gusty of 59 mph was recorded at the Douglas Pass ASOS with a gust of 45 mph recorded at the Craig ASOS during the early evening hours. While there were some showers associated with the right entrance region of the jet later in the evening, they were high-based and produced some gusty winds. Precipitation totals slowly increased overnight as earlier showers helped wet the lower levels of the atmosphere as well as a cold front passage. Radar rainfall estimates were highest over the northwest Northern Mountains where estimations were around 0.3 inches. The Dry Lake SNOTEL site near Steamboat recorded 0.2 inches for the 24-hour period. Totals just over 0.1 inches were estimated over the Central Mountains from the overnight/early morning rainfall. Unfortunately, these low totals also did not do much to help with the containment of the ongoing fires.